The baseball collecting world is familiar with the Bowman name and the Bowman Inception product. With all Bowman products, the focus is on prospects. 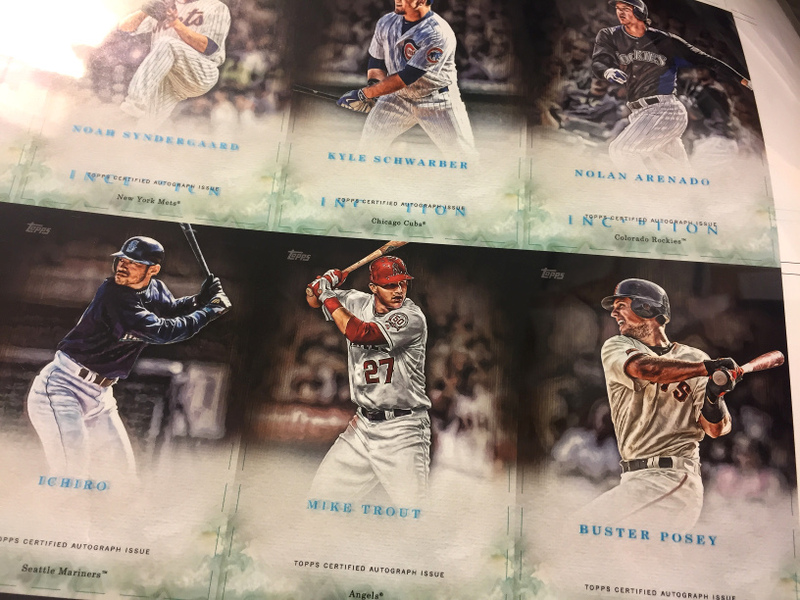 2017 Topps Inception Baseball sees that focus shift a little. There’s still the similar look and attention to autographs but the checklist is centered on veterans and rookies rather than those working their way up through the minors. 2017 Topps Inception arrives TODAY at Sports Cards Plus. Like Bowman Inception, each box has just one pack. In it is either an autograph or an autographed relic card. 2017 Topps Inception Baseball does have a base set. This is another shift from past Bowman versions. It features 100 current players with an emphasis on the game’s younger stars. Four base cards are in every box. Joining them are two numbered parallels from a list that includes Green, Purple (/15), Magenta (/99), Red (/75), Orange (/50), Blue (/25), Printing Plates and Inception (1/1). Yes, that makes the toughest base parallels Topps Inception Inception cards. 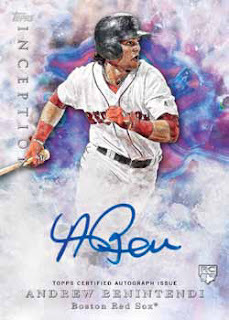 Base Rookie and Emerging Stars Autographs make up the bulk of the signed content in 2017 Topps Inception Baseball. These are signed on-card. Like the base set, young players get the spotlight. Parallels come in Magenta (/99), Red (/75), Orange (/50), Blue (/25) and Inception (1/1). The product has a couple of additional signature inserts. Inception Silver Signings are hard-signed using silver ink. They look similar to the Bowman Black Autographs from a couple of years ago. These are a case hit with all versions being numbered including the Gold and Gold Inscription (1/1) parallels. Inception Legendary Debut Autographs show players from early in their career. Also signed on-card, all are numbered. Parallels come in Orange (/10), Blue (/5) and Inception (1/1). Inception Autograph Relic cards fall approximately 1:4 boxes. The jersey swatch is on the large side and all come numbered. Parallels all have premium swatches: Magenta Patch, Red Patch, Orange Patch, Blue Button and Inception Majestic Logo. Inception Autographed Jumbo Patch cards are another case hit. As the name suggests, the patch piece is big. The design is somewhat similar to the Silhouette cards from Panini. Parallels are available in Orange, Blue and Inception (1/1). 2017 Topps Inception Baseball has a few premium autographed relic book cards, although they’re extremely tough. These include Inception Autograph Team Logo Patch Books (/2), Inception Autograph Letter Patch Books (/2), Inception Autograph Laundry Tag Books (/2) and Inception Autograph MLB Silhouetted Batter Logo Patch Book (1/1).